I really love cover for Gates of Thread and Stone and that made me oddly hesitant to start reading: I think I feared that the book itself would not live up to my first impression. Fortunately, it did not take long for me to be entirely hooked by the story. The main thread of the book, Reev's disappearance, happens very early, and from then on, main character Kai is focused on finding him. Well, she's focused on that *and* the intriguing Avan, who seems determined to stick by her side. I was definitely more into the romance than the main plot, but I think the main plot was still pretty strong. Kai's focus on her goal - finding and if necessary rescuing Reev - is admirable, and I appreciated that unlike in so many other books, she wasn't completely sidetracked by her attraction to Avan. That said, I was hoping that the relationship between these two snowballed a little faster than it did. I thought that Gates has some really unique worldbuilding elements (the Infinites, who are god-like, and their descendants, for one, as well as the mash-up of fantasy and dystopia), and there was just enough worldbuilding flavour to keep me interested without infodumping. I was pretty willing to go with the flow, and while I did have some questions (and wanted to know more about the history and geography of this world), they didn't detract from my overall enjoyment of the story. I loved the division of the city, the little cultural details that conveyed the class differences as much as the attitudes. This story has a very intimate feel even though there are some really big (like... city-wide, at the least) consequences to the potential outcomes of the plot. I saw this as a reflection of Kai's narrow focus - I thought she was much more concerned about her brother than the big picture. This book does end on quite a cliffhanger - which makes it particularly fortunate that the second book is due for release next week! I'm looking forward to reading it in the next few days. 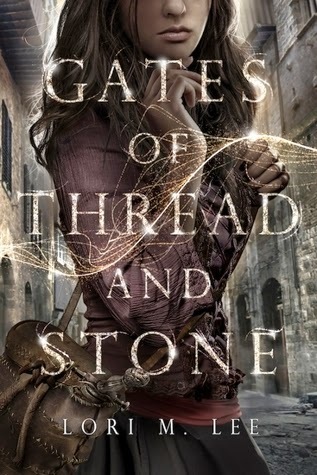 Gates of Thread and Stone is a very enjoyable YA fantasy/dystopia story. I thought the feel of this world was great - there were enough details that I could easily picture this place in my mind. I'm hooked - bring on book two!